Front Suspension 41mm upside down forks. The first thing that will strike you about the Hyosung GV 650 Aquila, before you sit on it, before you fire it up, is the look. The styling is tautly fluid like a droplet shaped by surface tension with flowing curves. It instantly invokes thoughts of a "V-Rod light", but with a hint of Yamaha Warrior thrown into a design ethos rooted in a profusion of deep and sweeping chrome. The look is stunning, modern and classic all at once, and while inspired by other brands, is much more original than the mobs of Harley-esque clones swamping the Sunday roads. Thumbing the starter the GV 650 comes to life, and after the choke has been sorted the engine note is a portent of further good things to come. The track is an odd place to test a cruiser, but then the GV 650 is not a standard issue offering and that's because normally in cruiser land there is a high price of style; under the weight of chrome and leather, performance is quickly and thoroughly crushed. 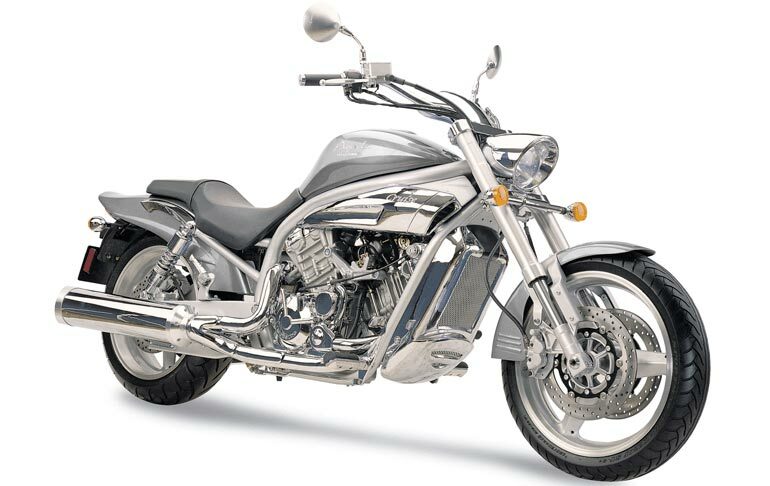 The recipe for a cruiser is a tried and true one, a torque laden v-twin engine, a relaxed foot forward chassis, comfortable all day ergonomics, and style. Hyosung has done up a proper cruiser in all these respects, and then they went on to mix it up a bit, like a modern martini versus a classic dry offering. The end result extends the class and amuses the rider's pallet a lot more than the tried, tired and true cruiser mix. The key ingredient to this potion is the engine. Twist the throttle and the fuel flows through the twin 39-mm Mikumi carbs with a smooth linear feeling, and pickup that leaves one with a heady sensation. While testing the Honda Shadow Aero last year, I was left wanting when it came to the passes - with the GV 650 that will not be the case. The 647cc 90-degree twin spins up quickly, and feels best between 5000 and 7000rpm. Right there, those RPM figures tell you everything you need to know about the cocktail being served up; an engine that feels strong where many other cruisers are slamming against the redline. Smooth motivation is provided by a moderately detuned version of Hyosungï¿½s 650cc plant, putting out approximately 70 hp, and a suitably flat torque curve mustering a peak 6.28kgf-m at 7500rpm. Those figures aren't power cruiser territory, until you factor in that the Aquila is light, 220kg (claimed dry). 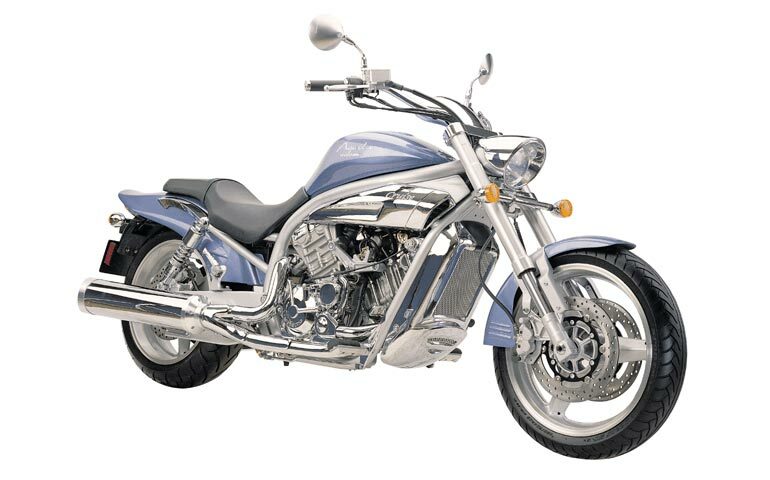 Honda's Shadow 750, comes in at 221kg, but only lays claim to a mere 43 hp. Suddenly the GV 650's output seems like a good amount of poke, and if this were a game of alcoholic content, the Hyosung's a shooter to the rest of the entry-level cruiser pack's "bland-name" beer. The Aquila's sporting aspirations shun the regular cruiser disappointment of twisting the loud handle and having more noise issue from a supra-litre lump and little to show for it. This small wonder may offer a pleasant blend of both the cruiser and sport worlds. The top speed is a claimed 200kph, and there's no reason to think that the GV 650 won't push into that neighborhood. The trade-off is you won't be idling around town in the top gear (5th), but that's a small concern. As soon as you open the throttle the Aquila reveals itself in a wash of acceleration and a rich low-key engine note for what it is; a proper free revving sport-cruiser. The sparkling engine is mixed with a lighter cleaner flavor, the Aquila's sprightly handling. Despite the Aquila's stretched out disposition, the steering is light and precise. The leverage offered by the comfortable bar position is excellent. The ride quality rendered by the Korean made 41mm Shin Woo upside forks, complemented by the twin rear shocks is good, coping with the moderate bumps and wallows the St-Eustache course offers with aplomb. Still, real world testing will reveal more about the suspension's nature than any track, given that BC's roads in no way approach manicured or periodically even maintained. At a mid-way adjustment of both front and back suspenders, the GV 650 felt solid and planted and that let us do something we don't often attempt with a cruiser. "Lean" isn't normally part of the cruiser recipe; it's akin to throwing a habanero pepper into vodka and calling it drinkable. Floorboards scrape and grind, chrome shreds away but this is a Sport-Cruiser so proper lean angles need to be attempted if the Aquila is to rise to its station. There are a couple things that do get in the way of it dominating that sport-cruiser niche, namely the bits that grind first in the bends. The legs forward position ensures your heel contacts well before any of the less expendable hard bits start to touch - an early warning system of sorts. Beyond that on the right side the exhaust flange takes the first abuse, on the left the side-stand. This should not be a concern under regular road riding conditions, and the grinding sound serves plenty of warning before any loss of traction occurs. Only the foolhardy would not attend to it. The Bridgestone BT-054s seem good match for this cruiser, letting one handily reach the bike's limits. The turn in is helped by the narrow 120/60 tire up front, and a 180/55 out back - narrow in power cruiser terms. One suspects that a StreetRod inspired sport-kit hiking the GV 650's skirts a little higher would be a valuable offering. A few small splashes of bitter marring the Aquilaï¿½s flavour in a small way. The stylish dash, with itï¿½s green LCD, is hard to read in direct sunlight, a cruiser's natural environment, as is the Neutral indicator. An oversight also made on other higher end offerings such as Honda's nigh-illegible ST1300 display. The brakes, unlike the footpegs, lack lever adjustment and are by no means eye-ball-popping. A firm squeeze is required to press the somewhat numb feeling double pistons to bite down on the twin 300mm stainless-steel disks. But this is a cruiser, and by the standards of the genre the braking doesnï¿½t need to be world stopping. Shifting is slick and smooth, but not exceptionally affirmative, and finding neutral on our preproduction tester proved a bit elusive. These items are a slight after-taste rather that outright flaws, and given the price, at $8,795 a few niggles are to be expected. The final and more standard part of the cruiser equation is comfort, and even here Hyosung has gone one better than the competition. The Aquila is short, with a 705mm (27.7 in) seat-height, making it easy for riders of all sizes to manage, but it doesn't fit small. That is the result of the 2-position pegs that do an admirable job of accommodating riders of all statures. I compared the fit of the Aquila with that of the Honda Shadow Aero, and the Aero came out worse for the attempt on my 6"2' frame, it felt cramped, whereas at full adjustment the Aquila simply say's lets go for a ride - a long one. Also speaking to that end is the seat; well padded and complete with supportive bum-pad it just says "all day ride". What serves as a gently curved straight stretch sees the speedo reading 100kph, the same as on Hyosung's sportier offerings. Pushing into the corners of the oncoming chicane my heal drags, giving plenty of warning and I back off the throttle, dab the rear brake, shift my shoulders some more, then power out of the corners to keep from scraping. The belt drive delivers power smoothly and provides a low maintenance dream in comparison to chain drive for those seeking the longer open roads. The past 5 turns of the course my mindï¿½s been far away - snaking down the Pacific Coast Highway dispatching unsuspecting Harleys and Camper vans. Often enough I come away from a cruiser wondering, why spend so much on a bike with massive displacement and so little go. The Aquila is different though, it has taken the cruiser recipe and made it stirring, not shaken. The Hyosung GV 650 Aquila , like champagne and red-bull, starts tentatively until the heady effervescence and energy of the martini for the masses concoction takes you by surprise. 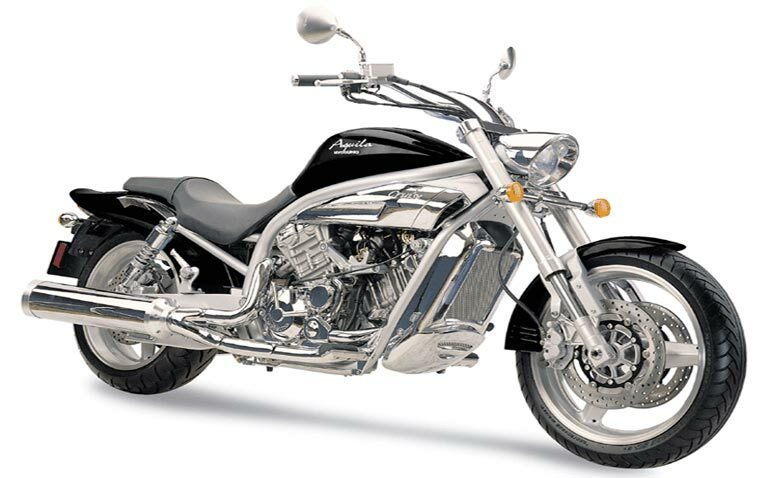 The cruiser recipe has been tweaked and freshened by Hyosung creating the mark's signature "original" offering - the Aquila . The effervescence of a sporting free-revving engine grafted into a stylish cruiser chassis imbued with light and responsive handling, makes the Aquila a consummate sport-cruiser and leaves other offerings in the niche feeling heavy, cumbersome and expensive. Hyosung has raised the cruiser bar with the Aquila, a bike that should attract a crossover audience, now it's up to the rest of the manufacturers to follow.